As she stepped on the track at Ratina Stadium in Tampere, Finland, for the third leg of the junior women's 4x400m relay at the IAAF U20 World Championships last July, Jan'Taijah Ford's mind went blank. That's how it's supposed to be, she thought. Ford was in her sanctuary, the round oval with bright white striped lines. She found peace here, despite the frenzied setting. "When I get on that track, I feel nothing--like I'm free," Ford said. Donning the Team USA singlet for the first time, it was quite the moment for the Oakland Park Northeast High School senior. And it confirmed Ford's dreams of competing at the Olympics someday. So far, Ford has already flourished in her final year on the track in 2019. 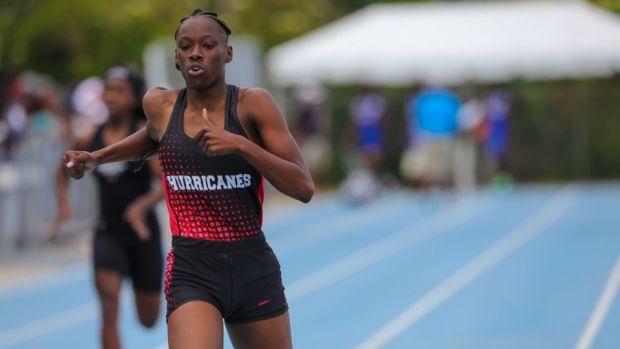 Beyond her last state championships in Florida, she's planning on lining up at the Flo Golden South Classic on May 18 in Orlando at 200 meters. It will be a major tune-up for big races in the weeks to follow. How fast can she go? By then, anything might be possible. Looking back at her U20 Championship experience, Ford would go on to split 54.69 for her leg en route to a first-place finish for the USA Junior women in the third heat of the semifinals of 4x400m relay. And it was the culmination of a busy, but fruitful junior season for Ford. She placed fifth in the 400 meters at USA Track and Field Junior Outdoor Championships in June, hitting what was then a PR of 52.52 seconds. Two weeks before that, she won the 400m at the Brooks PR Invitational in Seattle, landing what at that point was a PR in 53.06 seconds. This all came on the heels of her winning a third-consecutive Florida 3A state title in the 400m back in May. Now Ford, who will be enrolling and competing at the University of Southern California next fall, is about to close the books on one of the finest prep careers in Florida history. The journey began at William Dandy Middle School in Fort Lauderdale in the seventh grade when Ford joined the track team. That's where Damion Thomas Sr. first came across the petite young runner. Thomas was working with the sprinters at Oakland Park Northeast High School when one of the coaches from William Dandy decided to bring a group of athletes to the high school for a workout. It was a simple workout: 150 meter reps. But Ford clearly stood out from the rest of the group, which put her on Thomas' radar. And that radar is pretty good--he's produced a number of respectable athletes from the Broward County area, including his son, Damion Jr., who is currently a hurdler for Louisiana State University. For the elder Thomas, the first moment of awe with Ford as a sprinter came when she was in the eighth grade. Despite still being in middle school, Ford's marks were fast enough for her to compete at the Hurricane Alumni Invitational, a race that featured collegiate athletes. She ran 54.70 to place fourth, beating out opponents from schools like Miami, Syracuse, Vanderbilt and Villanova--at the age of 13 years old. "That was definitely the first big 'wow' moment," Thomas said. "(I said) 'OK, this kid can run.'" From there, Thomas and his wife Duchane took Ford under their guidance as she began her high school career. And Ford's freshman season was exactly what would expect from a phenom. She won the 400m at the Flo Golden South Classic and then the Florida 3A state title in the 400m. When she ended that year with a second place finish from Lane 2 in the 400m at Brooks PR, Thomas was again in awe. True to her competitive nature, she continued to dominate her sophomore and junior seasons. She defended her state titles in the 400m to cement herself as one of the more accoladed Florida prep athletes. Her training intensity has been ramped up over the years to match her progression, Ford said, and the results are there. Ford is currently US No. 1 in the 400m (52.17), which she recently ran at the Broward County Athletic Association Championships, and she's US No. 3 (23.30) in the 200m -- a race that saw her finish a hundredth of a second behind Northeast teammate Briana Williams, one of the world's top young short sprinters, a Jamaican youth international who grabbed doubled gold at the U20 Championships that same July. "So far, I'm satisfied," Ford said about her season. "But there's more to come, there's a little more to be fixed with me running the 400. I need to work pulling my arms back [on the last turn]." The Florida Class 3A State Championships are on the horizon for Ford. It's there where she will try to win her fourth consecutive title in the 400m as well as setting a personal best. Thomas said the time Ford is aiming for at the Florida state meet is in the mid 51-second range. The current Florida state meet record is 52.51, set by St. Thomas Aquinas grad Sanya Richards-Ross in 2002. Ford's next race after that will be in the 200m at Flo Golden South Classic on May 18. It's a meet that will feature a slew of the nation's best track and field athletes and a setting perfectly suited for Ford in the eyes of her coach. If Ford were to run both in the 51-second range for the 400m and the 22-second range -- mid or high -- in the 200m this season, it would certainly rank as an all-time season for a prep athlete in recent memory. Her future would be brighter than it already is. 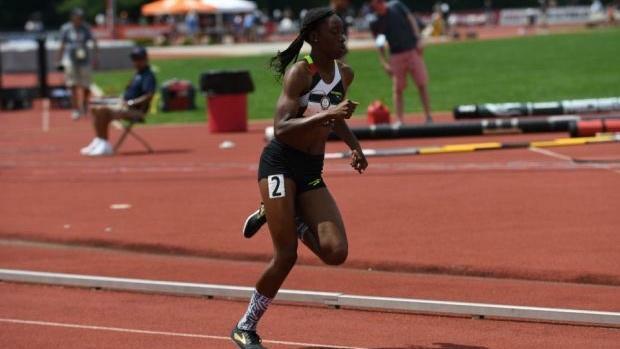 Already one of the most decorated Florida sprinters, Ford has the chance to add to her resume. And she's eager to do so. "I feel very excited," Ford said. "My goal is to run 22, and I think should I should achieve my goal at Golden South."